to their senses to vote for John McCain. We all know about the dangers of Hillary Clinton. On the other hand, Barack Obama (the man for "change") is touted as a Constitution scholar. Image the damage he will do promoting the misinterpretation of the Bill of Rights and his placing judges in the Court system that will dismantle our Constitutional freedoms. 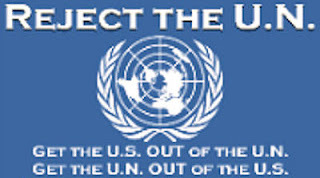 Example: Obama has already sponsored the United Nations “Global Poverty Act" which commits nations to banning “small arms and light weapons” and ratifying a series of treaties, including the International Criminal Court Treaty, the Kyoto Protocol (global warming treaty), the Convention on Biological Diversity, the Convention on the Elimination of All Forms of Discrimination Against Women, and the Convention on the Rights of the Child. 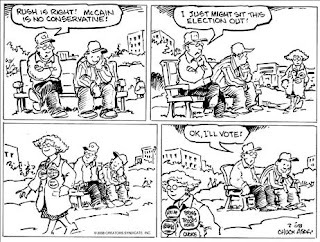 Tags: Barack Obama, Election 2008, UN, Global Poverty Act, Hillary Clinton, John McCain, political cartoon, The Bill of Rights To share or post to your site, click on "Post Link". Please mention / link to the ARRA News Service. Thanks!